The Internet of Things is an ever growing sector, an argument supported by the main researchers and experts. With a reasonable growth perspective, the market is demanding specialized engineers in the developing of IoT projects. There is a need to bridge the gap between the skills today’s employers require and the career development of a new and emerging IoT workforce. The continuous commitment with education is one of the main pillars of Libelium’s mission. Libelium configures its new learning portfolio by promoting skills with specialized courses. Depending on the objectives to reach, Libelium offers 3 different courses to acquire all the knowledge needed to be employed in the IoT market. Read more. More than 600 participants have competed in the second edition of the IoT Spartans Challenge, the commitment of Libelium with the IoT education. The contest looks for the best IoT developers worldwide with high-level exams and exercises. In this edition, only the 13% of the contestants have been able to finish the educational program. The IoT Spartans Challenge has obtained international presence as participants come from 260 universities from the five continents. The final battle has been tough and only just a few have been able to complete it. We want to congratulate all of them, specially the top 3 and the university winners. Read more. The project “Smart m-Health Application for Pregnancy Care Using Body Area Networks” developed with MySignals platform won the Most Innovative Project award at the 2nd International Saudi Health Informatics Conference (ISHIC) 2017 in Riyadh, Saudi Arabia. Read more. Obra Social Ibercaja collaborates with Grupo San Valero to economically support their participation in the IoT Spartans Challenge organized by Libelium. The agreement has been signed by Juan Carlos Sánchez Bielsa, Director at Obra Social de Ibercaja, and César Romero Tierno, General Director at Grupo San Valero. Centro San Valero is the first participant in Aragon that accepts the challenge to find the world’s best IoT developer by joining the Internet of Things revolution. Thanks to this agreement, Obra Social de Ibercaja will contribute with €4,000 for the center to participate in the Libelium’s IoT Spartans Challenge, confirming the commitment of this organization with the education and the new technologies formation. Read more. Libelium’s commitment with education pursues fostering the IoT skills among students in every University and Educational Institution all over the world. Enhancing education in IoT development will reinforce employment opportunities for future generations. The educational gap between skills demanded by IoT companies and practical knowledge of workforce could decrease or even endanger the expected growing of the market. Read more. The IoT Spartans Challenge, the educational online program for future developers powered by Libelium, has reached two cooperation agreements with The Internet of Things Talent Consortium (IoTTC) and Madrid Internet of Things Institute (MIOTI). 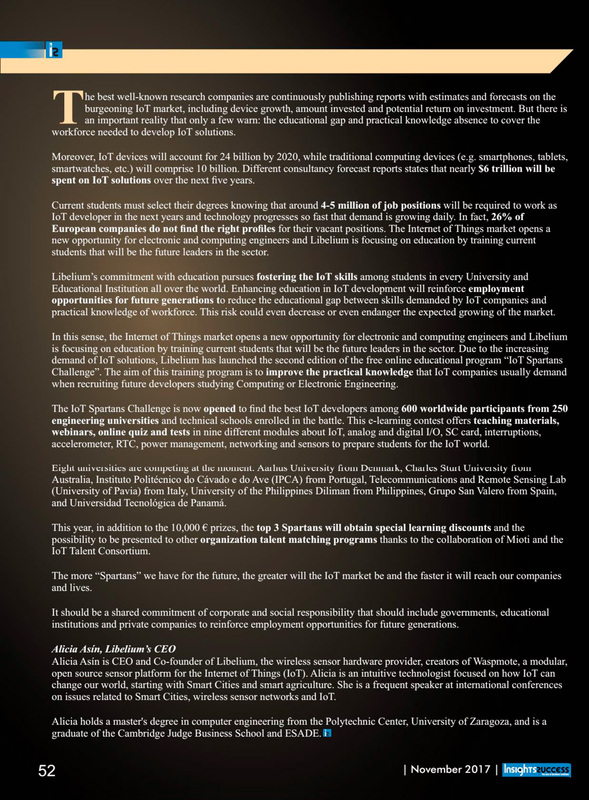 By these agreements, IoTTC and MIOTI have become sponsors of Libelium’s IoT Spartans Challenge just before the second edition of this initiative that starts on September 1st. Read more. Libelium has launched the second edition of the IoT Spartans Challenge, the educational program whose aim is to cover the gap between skills demanded by IoT companies and practical knowledge of workforce. The main novelty for this year is the Summer School that will be warming-up the course during summertime between the 15th of June and the 15th of July. Participants will have access to free webinars which explain basic concepts of the Internet of Things using Waspmote Sensor Platform. Read more. Read the entire article at Revista Cloud Computing. 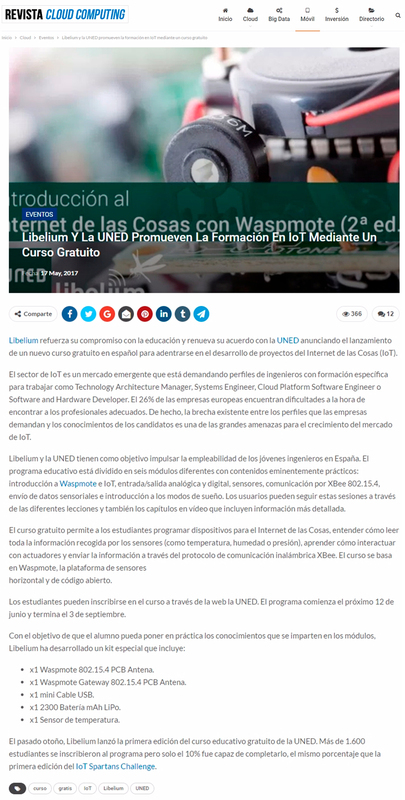 Libelium reinforces its commitment with education and joins UNED University to launch the second edition of a free educational course in Spanish to start developing Internet of Things (IoT) projects. Libelium and UNED aim to change the landscape in Spain. The educational program is divided in six different modules: Waspmote introduction and IoT, digital and analogical input/output, sensors, communication via XBee 802.15.4, how to send sensing data and introduction to the sleeping mode. Users can follow these sessions with the training material and also video chapters with further detailed information. Read more. Libelium announces the 2nd edition of the IoT Spartans Challenge to enhance worldwide education among students and universities promoting electronics skills. 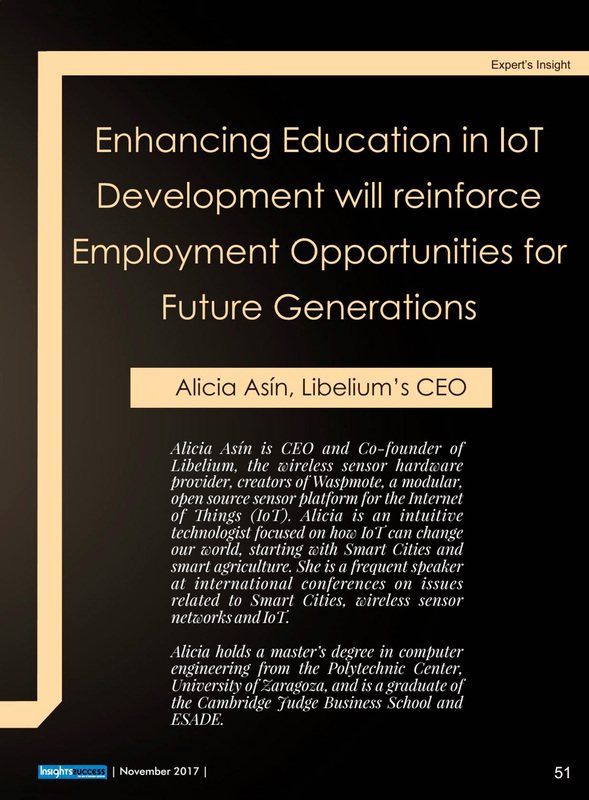 Education is one of the company strategic pillars and Libelium is reinforcing its commitment to cover the gap between the skills demanded by IoT companies and practical knowledge of workforce. In the upcoming years, there will be around 4.5 million of employment opportunities for IoT developers.